Cilantro/Kothamalli is one of my favorite herbs used extensively in my cooking for its aromatic flavor it imparts to any dish. 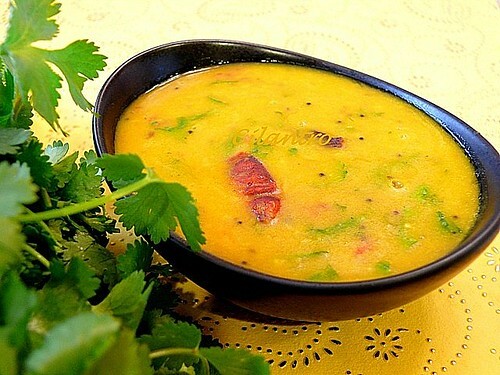 Cook the thuvaram paruppu/thur dhal with 1/4 teaspoon of turmeric powder. Wash, clean and chop Cilantro. Heat a tablespoon of oil a kadai/pan and add the seasoning in the order listed. Now add the onions, garlic and green chillies. When the onions turn soft add the tomatoes. When the mixture turns to a thick gravy and the oil starts to separate, add the cooked thuvaram paruppu/thur dhal. Finally add Cilantro, salt and mix well. Daal looks very delicious Cilantro. Btw can u check out this post of mine and let me know whether its fit for ur cilantro event, coz i am bit unsure.